Q: Were you on the field blocking for Byron’s last second kick versus Florida State the previous year? BS: No. What happened was, normally whenever you started at Nebraska you normally weren’t in on the field goal protection. For example, when I was coming up through the ranks, the only time I got on the field was for field goals. And it was exciting, obviously, and the games we were blowing guys out we got on the field. Q: The Fall of ’92 when we switched to the 4-3 defense. Do you recall that? BS: Yes, it was more or less the bubble defense that we ran. It was more or less a borrowing of what Arizona was running, and a lot of people went to that. Oh, absolutely, I recall the switch. It made a huge difference for us, because it reminds me -defenses that run it today, it’s an unconventional defense when you look at it, because it can have a resemblance of a 3-4- but what happens is you have a guy who can float around. New England runs it a lot. And what it does, it creates confusion up front for your offensive line, because if you’re going against a conventional defense you‘ve got a Mike Linebacker, a Will, a Buck, a Sam, whatever you want to call it. And basically, what you are doing is, you’re trying to recognize the strength of the defense, and from that Middle Linebacker you go either left or right depending on the play and the strength of the defense. And what that defense will do is not only give the linebacker the ability to come up and “Green Dog” a little bit or play back and then come late, but also gives the ability to kind of disguise a lot of what you’re doing as far as blitz packages and gives someone the ability to put their hand down and walk around a little bit and create confusion up front. Q: How long did you see that in practice until they broke it out for the Colorado game? BS: Oh, I don’t know. The thing about it was, when you’re talking about some of the bigger games that we played, we would mix different days here and there. If we had extra days early in the season we’d mix in a little Colorado here and there. And we saw it for quite some time. And obviously, I didn’t play on that side of the ball, but I knew with the type of guys we had -especially the defensive backfield and the linebackers we had, very athletic types- we had guys who could cover a guy coming out of the backfield and then go against the big guys when rushing, trying to penetrate that line. And in one shape or form, Coach McBride would implement a defense that would obviously create a lot of confusion and havoc and then just literally dominate the game. 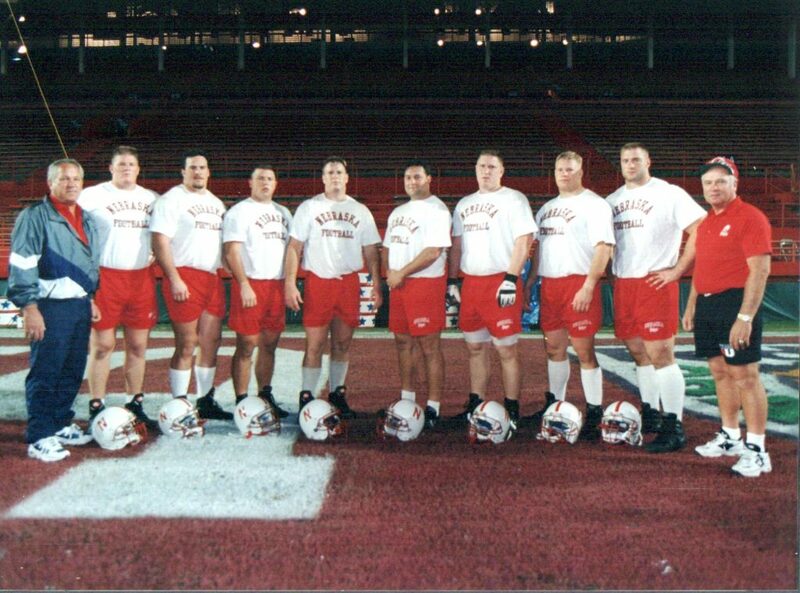 The Blackshirts really came to fruition that ’92 season..
Q: Do you have a favorite or most memorable play? BS: I’m gonna go one step further: let me go with most memorable picture. The picture I remember -and I still have it to this day- Calvin Jones, we were playing, (it might have been the Colorado State Rams) we were playing them at home and I think it was pretty much an inside zone play, but what you see in the picture is: there’s five defenders on the ground, maybe 4 defenders on the ground, and there’s me and Aaron that are on top of them all, and basically they’re just flattened on the ground, and I’m looking up at Calvin. We’re in the background and Calvin is literally 25-30 yards down the field. And in the background with me you see Aaron on top of his guy, basically with his hand in his face, bending him backwards, just driving him into the ground, like the guy’d killed his mother. It was just a great picture. And some of the moments that I remember? It was just offensive line play. And a lot of people don’t know this, but we played Oklahoma State, it was on TV, and one of their linebackers was an All-American and he was chirping in the paper all week long about how he was going to let us have it and this and that. And we were watching film the night before the game at the hotel and Coach Tenopir, he’s got film of the Oklahoma State defense up there and he makes reference to this player, and he goes, “We can’t let this guy do this to us. You guys up front, Brenden, you make sure he doesn’t this and that..” And Aaron looks over at me -and Aaron tells the story better than I do- he looks over at me and says, “What are you thinking?” And he says that I looked at him with the most intense, psychotic look and said, ‘I’m gonna knock… him… out!,’ right? First play of the game, Paul… first play of the game I come off the ball and I hit this guy so hard upside the head, he goes just like a freaking bean bag, like a sack of potatoes, just goes limp and, boom, just drops. I knocked him out! I couldn’t believe I’d knocked him out, you know?! I went back to the huddle and I looked at Aaron and he goes, “We freaking knocked him out!”(laughs) You didn’t hear from him the whole game, he was out. I gave him a concussion. And he pretty much vanished from the national scene after that play. Of course, that was Coach Osborne’s 200th victory, maybe? I pretty much went in there and smacked him upside the head. And there were other things. We used to come off the ball and do some crazy stuff. We’d get up underneath guys. And if you understand offensive line play, it’s all about leverage. And what you try to do is start off low, and you get high, and a lot of times when I would get into guys -all of us really- we’d do this: we’d grab guys up underneath the shoulder pads and with our free hand we’d take the backside of their leg and flip them over. You just didn’t see that, you know? Just killing guys, driving them 10-15 yards down the field and just annihilating them. Those are the type of things you take pride in as an offensive line. We just dominated that way. We set the tone for those guys afterward. That’s what I’m most proud of, when we look back on what we did, we set the table for the success for everybody across the board, the whole team. The guys I came in with and graduated with, we all put a lot of effort into trying to establish a different culture as far as a team: Nebraska dominating. Wearing them out and dominating. And every time you walk out and line up on that line those other guys are just, “Oh no, here they come again.” That’s the mindset that we wanted, you know? And that’s the biggest thing I take away from playing for Nebraska, just creating that atmosphere there. And every time I watch teams now, I’m very active with the radio show and I see these guys and I wish they could feel that. You look back on some other games, of course, one of the games obviously was the National Championship game, there’s nothing that can beat that. That was a culmination of 4½ years of hard work, blood, sweat and tears. That all came together and that was something special. The stories go on and on and on, but when you talk about some of my memories and the most wonderful things I took away from it, it was the guys and just the relationships with the guys that you take away that was special. It was awesome. Q: Any favorite practice stories or recollections? BS: Well, two of the best recollections I can give you are these… I used to love goal line plays. We would have one of our drills -the drill was on the goal line, 1’s versus 1’s- two shots at getting into the end zone. And Coach Osborne, he’d stand on the sidelines and he’d be the official, giving us the touchdown or not. And what was great about those moments was, it was at the end of practice and everybody was fired up. It was just crazy. The defense was fired up, defensive coaches were fired up; you had Coach McBride yelling, spitting and screaming. All the guys on the defensive side of the ball hooting and hollering, trying to get us to jump off-sides. All the offensive coaches fired us up, giving us the play, “Get after it!” And just getting two shots to go after the best and get into the end zone, you know? That was great. And, of course, those goal line situations we would just run in practices, driving down the field in practice, Aaron and I and everybody would look over and we’d say, “National Championship, here we go! Last drive! Here we go! Come on, National Championship!” And we’d do that all year long, for two years. And of course we’re in the championship game, Paul, and we’re driving the field. We’re driving down the field. Here we are, we’re getting to ready to win the National Championship. (Before all this happens, in the beginning of the game? I think Aaron steps on my feet 4 or 5 times and he’s wearing, I think, inch and a half spikes, ok? I don’t know if you’ve ever had a 300 lb. human being step right on top of your foot, right on top with one of those spikes. It hurts. Literally, I couldn’t walk for like a month. I was limping, it hurt so bad -of course, not that night- but I was getting sick of him stepping on my feet, right?) So here we are, we’re getting ready, we’re driving down the field, we’re doing it for the National Championship, we’re doing our thing, we’re getting close to the red zone, we’re getting in there and Aaron looks at me and says, “Let’s go! National Championship! Here we go!“ And I look at him and I go, “Quit stepping on my feet!” (laughs) It was one of those stories you never forget. All the preparation that we put in, it was something else. Q: Anyone behind the scenes who meant something special? BS: Well, as far as behind the scenes: Everybody. You can’t leave one person out. Trainers Jerry Weber, Doak, all those guys, it was a family atmosphere. There was a cohesiveness and chemistry that was there. And I remember Coach Ron Brown talking about it. Here’s a bunch of these coaches that had been there forever and just understood not only Coach Osborne’s philosophy, but each other. And you know those final years, where the cylinders, everything was going at 100 miles an hour? Everything was working like a perfectly oiled machine. That being said, you not only had a family atmosphere with Coach Osborne allowing those coaches to have a family life, but also instilling that family atmosphere with the team. The unity we had, there was a couple guys you’ve really got to throw some props to behind the scenes that worked with me, each and every day behind the scenes, on the sideline. And to this day -I did a camp out at USC, a Nike camp- and here I was in the USC weightroom and I’m overseeing the Bench Press part of the Combine Camp, and Bryan Bailey comes walking out of the office and he’s standing there with Mark Sanchez and Matt Leinert. And he points to me and he says, “This is the guy!“ He starts going off about the work ethic and all that stuff, the weight room, and what we did out on the field. “This is the guy…” Bryan? There wasn’t one time I couldn’t say, ‘Bryan, I need you today,’ and he was always there for me. And some of the other guys? Ed Stewart, great leader. A guy that sacrificed a lot trying to convert from a safety to a linebacker, and ended up being one of the better linebackers in the nation. And guys like Terry Connealy, there was a guy who was mild-mannered off the field, just a good gentleman, came from a great family, one of our captains, just great leadership from our captains. Every week a captain would get in front of our team, and he started off as a low rumble in his speech just before we went out on the field, but at the end of that speech, I don’t know how he could talk after this, but his face was bright red, purple almost, he was just screaming at the top of his voice, banging into guys, just sweatin’ and spittin’ and getting everybody riled up and then, BOOM!, we’d hit the field. But Terry, you know, those type of guys who had just a complete and utter passion, for not only football, but Nebraska Football? Those are the guys you want leading your team. The list goes on and on, but it was a great experience. And it’s weird, you know, your best friend you had as a kid or in high school, you know? You see them twenty years down the road and it’s like you just saw ’em yesterday, and I think that’s really the best way to capture the friendship and those relationships we had on that team. It’s something that you never forget. We did something for the state that really was never done, and of course those guys after us had a chance to do it, but this state went twenty-some odd years after the last National Championship and we brought it back, you know? And it was something else. I remember Zach Weigert and I talking one day about it, he said, “Do you understand if we won the national championship, what this will do for the state of Nebraska, but also for us?” I mean, just leaving a legacy of this team that came in here from ’90 to ’94, what we did.” And it was true. He spoke nothing but truth with that statement. It was an amazing thing, and a lot of things were spurred after that championship season, that whole ‘Eye in the Sky’ and the tunnel walk, that all started. I remember the first time I heard it, it was on the radio and they were talking about the possibility of us going on a National Championship run, and everything that came together at the end there, it was all just very special. Q: So you met those goals that Coach Tenopir thought were kind of lofty? BS: Yeah, yeah, you know I wasn’t quite the best, but I had a chance to play next to the best with Zach Weigert winning the Outland Trophy there. The thing I’m prideful of, for playing next to him, was that not only was he a great player, but he made me a great player, and it’s infectious. Zach and I were the fourth pair of All-American guard and tackles ever in the NCAA’s history. To achieve something like that is pretty cool. You know Zach, when he won that -and this is what epitomizes the type of team that we had- when he won the Outland Trophy the first thing he did was, he paid respect to not only his teammates, but in particular the offensive line. He went right down the line and named all of us. And that’s just like the kind of man Coach Osborne was, the young men who came in as kids? He wanted to obviously mature them into great football players and great men. Good stuff! You may recall Boyd Epley’s interview a few pages earlier, especially the place where he mentioned how the freshman offensive linemen of the time reaped the benefits of the team’s newfound commitment. Brenden Stai was one of the freshman linemen in attendance that historic day and what he said in this conversation about creating a new order, a new way of thinking, of acting, of forgoing all but complete dedication to the endeavor, speaks volumes about the direction Nebraska Football began aiming. In Boyd’s interview I brought up the title of what I find to be an absolutely fascinating book, Influence: The Psychology of Persuasion by Robert B Cialdini, Ph.D. In it he writes about innate human longing to be perceived as consistent, and goes on to say this about the power of commitment, “If I can get you to make a commitment (that is, to take a stand, go on record), I will have set the stage for your automatic(..) consistency with that earlier commitment. Once a stand is taken, there is a natural tendency to behave in ways that are stubbornly consistent with that stand.” Read that again. “Once a stand is taken…” The terms stubborn and consistent exemplify many individuals of that 60 & 3 era. And take a stand is exactly what Brenden did. Much more than a mere drone going about his business and doing only as he was coached, Brenden played a large part in turning the fortunes of the Nebraska offense’s bread & butter -the offensive line- into an unstoppable fighting force. Can you imagine the letdown he felt upon his first few weeks in the Nebraska weight room? Here he was, a high school kid with visions of joining the big boys, lifting alongside the hulking brutes of the Varsity O-line, only to find that it was all mostly in his imagination. Now, this isn’t a blanket statement or full-scale indictment of the entire offensive line of the earlier time, but it was a fairly apt generalization: these kids just weren’t hard-core weightlifters. (Also, I might add, this fact should lend valuable reverence for Offensive Line Coaches Milt Tenopir and Dan Young’s ability to turn out quality O-line performances despite the lack of physically dominating kids at the time.) 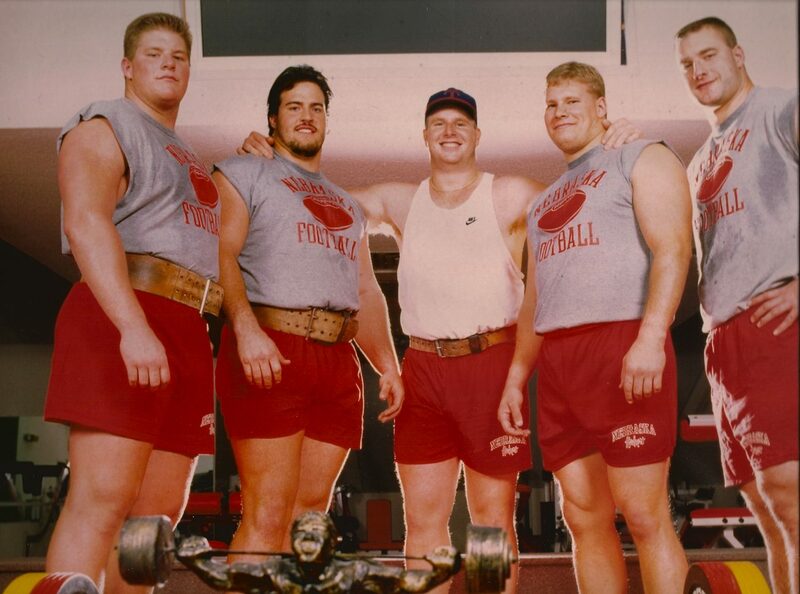 But Brenden and his buddies helped to change all of that, and once the ‘6 weeks of Accountability’ of that 1991 Winter Conditioning session hit, the young guns’ attitude about moving some weightroom iron around spread like prairie wildfire to the rest of the bunch. Fanned by those earlier flames, the Unity Council was simply a rational next step. Now, if you were to ask me to place a label on what came out of those brainstorming sessions between Brenden and his linemates, I would call it “The N Factor.” Why? Because their focus was not merely on raising their own level of performance, but that of the eNtire organization. (grammatical error mine) They were interested in collectively, more than individually, finding the magic elixir that would propel them to greatness. Brenden mentioned the metaphor of the ‘reset button’ and reaching back to the legacy of the last national championship teams of the ’70’s for clues, i.e. Socks-up Tuesday. I loved that part. At a young age they already possessed ‘the 10,000 foot vision,’ considering and evaluating an issue from an executive point of view, a mature and educated one at that. Some folks call it ‘big picture’ thinking, and the final result was an artful piece of work. I will begin to label the facts, findings and distinctions of ‘The N Factor” as we go on, because I’m beginning to notice golden nuggets are piling up and feel that doing so will help manage the key points gathered along our journey. Thus far The N Factor consists of: commitment, accountability, repetition, reciprocation, sacrifice, family, role, humility, vision, legacy & community support. We’re off to a good start, anyway.